Julie Kieras - Yoga Off Broadway | Yoga for Every Body! Julie’s essence of living in the present moment powers her curiosity, playfulness and exploratory nature. She teaches with mindful purpose and love, focusing on the breath. Through breath connection, she guides her students to experience a shift: truly feeling each pose and uniting body with inner spirit. 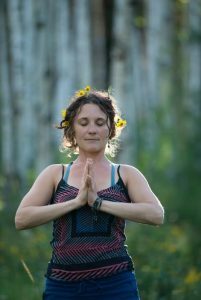 She immersed herself into the teaching world in 2010 in Boulder, where Julie completed her 200-EYRT with Shannon Paige, Gina Caputo, and Nancy Kate Rau. To support her love for children she studied with Yoga for Young Warriors and Next Generation Yoga. After noticing that her energetic nature also required deep rest she took Anjali Restorative Training with Julia Clarke. Off the mat Julie can be found whipping up delicious recipes in her kitchen, swimming in the river, dancing in the rain, and cruising up and down mountains anyway she can!